Madrid-based visual artist Daniel Canogar unveils first permanent piece of public art in the U.S. The video display content is the result of a public-participation performance, a signature method of the artist. MADRID.- Daniel Canogar, a Madrid-based visual artist, recently unveiled his first permanent piece of public art in the U.S. 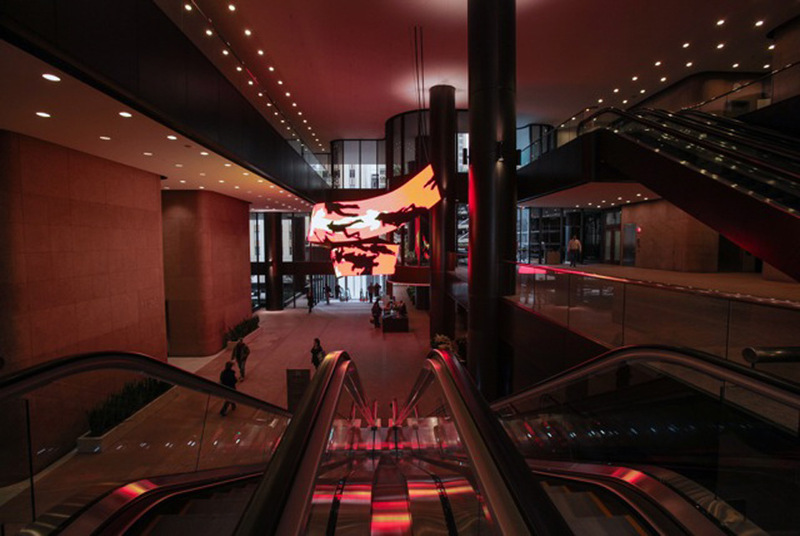 Waves, a suspended 24-foot sculptural LED video installation in Houston, Texas, echoes the flow and constant current of people walking through the atrium daily. The video display content is the result of a public-participation performance, a signature method of the artist. 90 workers and tenants of the building complex, as well as passersby, performed over a green-screen surface while being captured by Canogars over-head video camera. They were first asked to crawl, and then encouraged to be creative. They danced, ran and cartwheeled. The result is a dynamic video animation featuring the buildings residents and workers and the local Houston community in both realistic and abstract forms. It was important for me to observe how the public uses the space to determine the final shape of the artwork. I also wanted to take advantage of the second and third levels of the atrium to encourage the viewer to discover different angles from which to contemplate the sculpture claims the artist. This exciting installation was fabricated with LED tiles specially designed by the artist. The piece required flexible LED tiles in order to allow them to both bend and twist, a recent technological innovation. The possibility of undulating screens has always intrigued Canogar, and extends from his deep-rooted interest in moving beyond the flat rectangular confines of the traditional pictorial frame. Video feed travels through the twisting ribbon-like screen. The display not only renders bright video images, but also illuminates the surrounding environment with swaths of color. The management company received over 30 proposals. Canogars stood out because his vision reflected an understanding of the space as a thoroughfare, and a commitment to energizing it with something bold and dynamic but also something that involved the community of workers and users. Daniel Canogar's latest exhibition in Sweden features 4 pieces, one, Sikka Magnum, was designed especially for this exhibition. Sikka is a sculptural video installation constructed from 360 used DVDs. This multi-thematic piece was inspired by sikka, the gold coins sewn to clothing dating back to Babylonic times that eventually became the shiny plastic objects we know today as sequins. By projecting the contents of the DVDs back onto their surfaces the artist continues to investigate both new uses for discarded objects as well as his interest in combining the phantasmagorical properties of cinema with its physical elements. In this case, film segments were selected from each of the DVDs for their color, shape and movement value, forming a digital palette from which the final projected loops were constructed. The accompanying self-generated soundtrack is the resulting accidental composition created by layering the soundtracks from the actual segments being projected. The final effect is that of an audio-visual mosaic. Historically, sikka were worn to remind onlookers of the wealth and power of those wearing them while also evoking the light of the divine. Similarly, the surfaces of the DVDs flash back at us images born from the glamorous world of Hollywood where image is converted to a kind of currency. Daniel Canogar (Madrid, 1964) received an M.A. from NYU and the International Center for Photography in 1990. His work as a visual artist focuses on photography, video, and installation art. He is heralded for his innovative, sophisticated and pioneering use of technology as an art form. Daniel Canogar has created numerous public art pieces, including Waves, a permanent sculptural installation made with LED tiles, for the atrium of 2 Houston Center, Houston; Travesías, a flexible LED screen commissioned for the atrium of the European Union Council in Brussels during the Spanish Presidency of the European Union in 2010; Constelaciones the largest photo-mosaic in Europe created for two pedestrian bridges over the Manzanares River, in MRío Park, Madrid; Nodi, two photo-murals in the Arensa Train Station in Naples; Clandestinos, a video-projection presented on various emblematic monuments including the Arcos de Lapa in Rio de Janeiro, the Puerta de Alcalá in Madrid and the church of San Pietro in Montorio in Rome. His recent work includes Asalto New York, a video-projection on the façade of an abandoned factory in Brooklyn, NY; Latidos, a solo exhibition at Espacio Fundación Telefónica Buenos Aires; Vórtices, an exhibition exploring issues of water and sustainability at the Fundación Canal Isabel II in Madrid; Synaptic Passage, an installation commissioned for the exhibition "Brain: The Inside Story" at the American Museum of Natural History in New York; and two installations at the Sundance Film Festival 2011 in Park City, Utah. He has exhibited in the Reina Sofia Contemporary Art Museum, Madrid; the Palacio Velázquez, Madrid; Max Estrella Gallery, Madrid; bitforms Gallery, New York; Filomena Soares Gallery, Lisbon; Guy Bärtschi Gallery, Geneve; Mimmo Scognamiglio Artecontemporanea, Milano; the Santa Mónica Art Center, Barcelona; the Alejandro Otero Museum, Caracas; the Wexner Center for the Arts, Ohio; the Offenes Kulturhaus Center for Contemporary Art, Linz; the Kunstsammlung Nordrhein Westfallen, Dusseldorf; Hamburger Banhof Museum, Berlin; Borusan Contemporary Museum, Istanbul; the American Museum of Natural History, New York; the Andy Warhol Museum, Pittsburgh and the Mattress Factory Museum, Pittsburgh. No buried Spitfires in Myanmar, stories of the stashed planes are merely "legend"